The celebrations began in the far eastern city of Vladivostok, where dozens of navy vessels and submarines from the country's Pacific Fleet put on a public display, according to Russian state media. Russia flaunts military might across the world with Navy Day celebrations – Russia’s full naval might was on display Sunday as the country celebrated its annual Navy Day in multiple time zones, with parades and demonstrations held in all four corners of its vast territory, as well as at Russian bases abroad — including in Syria and in annexed Crimea. The scale of the Navy Day celebrations is “unprecedented,” according to military analyst Tyler Rogoway, and along with a huge parade held by China’s armed forces the same day, a “reminder of rising global military competition” faced by the US. Celebrations were also held on the other side of the country in Baltiysk, the western base of Russia’s Baltic Fleet. 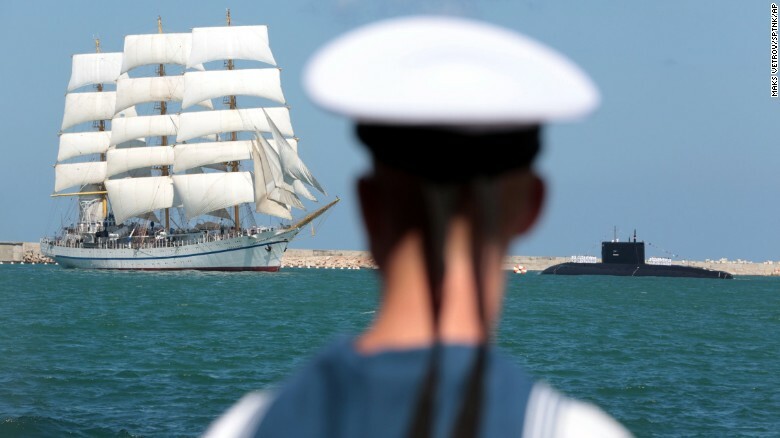 A Russian training ship, the Khersones, during a naval parade to mark Russian Navy Day in Sevastopol, Crimea. Other celebrations included the display of the navy’s flagship aircraft carrier, the Admiral Kuznetsov, near its base in the northern city of Severomorsk. 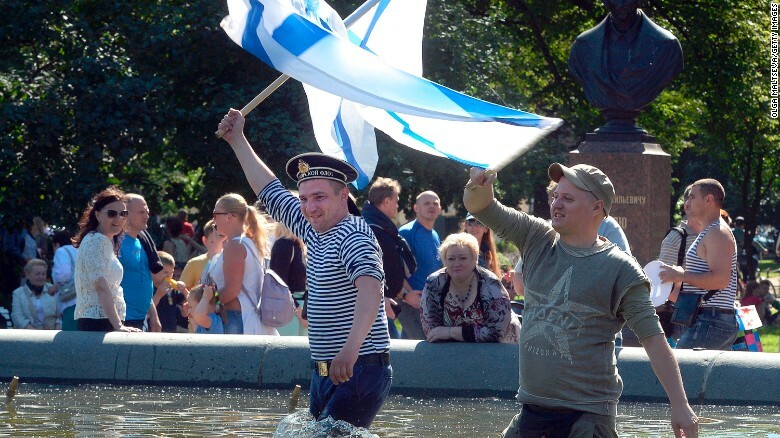 Russian Navy veterans celebrate Navy Day in St Petersburg. 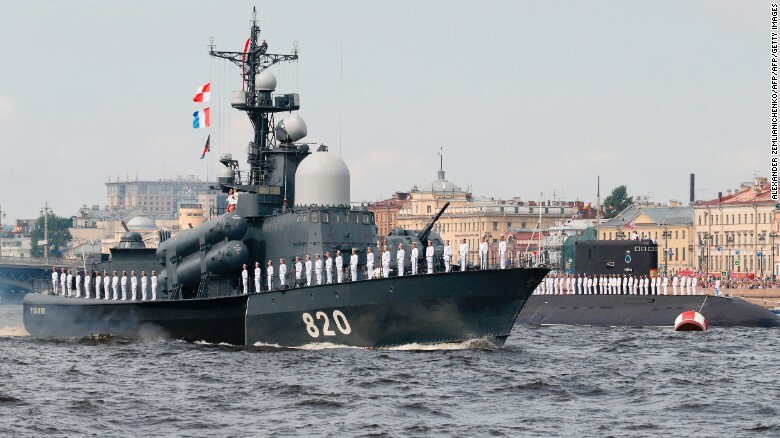 The main events of the day were carried out in St. Petersburg, where Russian President Vladimir Putin oversaw a parade featuring 50 combat ships and submarines, and a further 40 aircraft. More than 5,000 sailors from the Baltic, Black Sea, Northern, Pacific fleets and the Caspian Flotilla participated in the parade. “Russia’s history is inseparable from the victories of its courageous and fearless Navy,” Putin said in a speech that drew heavily on naval history, in which he outlined the continued importance of the country’s fleet. “Much is being done today for the development and renovation of the Navy. New ships are being commissioned, the fleet’s combat training and readiness are being perfected,” he said. The celebrations came as US Vice President Mike Pence visited Estonia, the first leg of an Eastern European trip that will also take him to Georgia and Montenegro to show US support for them and NATO in the face of what the administration has called Russia’s destabilizing activities in Ukraine and elsewhere. A Russian Navy vessel sails along the Neva River during the naval parade for Russia’s Navy Day in St. Petersburg. Several carrier-based Su-33 and MiG-29K fighter jets, recently deployed in operations in Syria, took part in an aerial display, according to Russia Today. The state media outlet reported that Putin announced the addition of 30 new vessels to the Russian fleet in the coming year. Two Chinese warships, the guided-missile destroyer Hefei and frigate Yuncheng, also took part in the main celebration in St. Petersburg. The presence of the vessels is a “major symbol of the deepening military ties between Moscow and Beijing,” according to Rogoway, the military analyst. 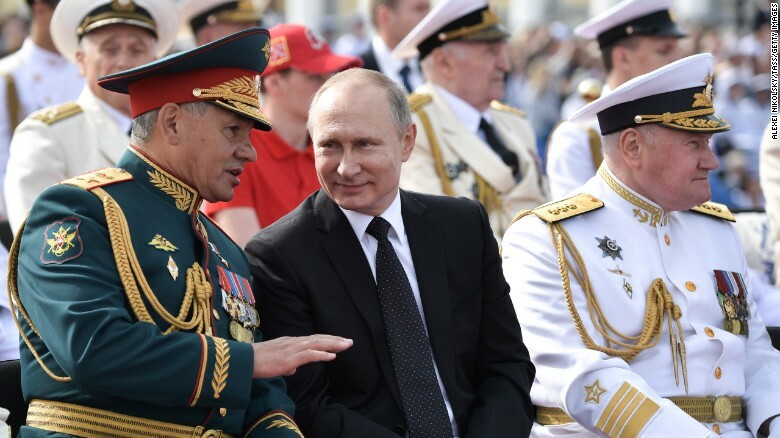 Russian Defense Minister Sergei Shoigu, President Vladimir Putin, and the commander-in-chief of the Russian Navy Adm. Vladimir Korolev review a naval parade in St. Petersburg. The presence of the vessels intrigued Russians and were a source of pride for expatriate Chinese living and working in Russia. “I am very proud to see Chinese vessels here,” said St. Petersburg-based Chinese national Tian Haowen, during an interview with Chinese state broadcaster CCTV. 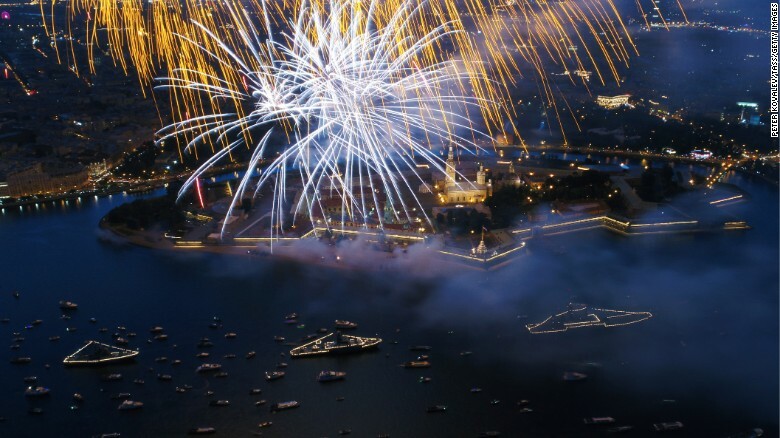 Fireworks go off to mark Russian Navy Day in St. Petersburg. More controversially, Russian vessels took part in events held in Sevastapol, the Crimean port annexed by Russia in 2014, and in Tartus, the Syrian military base from which the Russian military has launched operations against Syrian rebels, providing assistance to the regime of Syrian President Bashar al Assad. 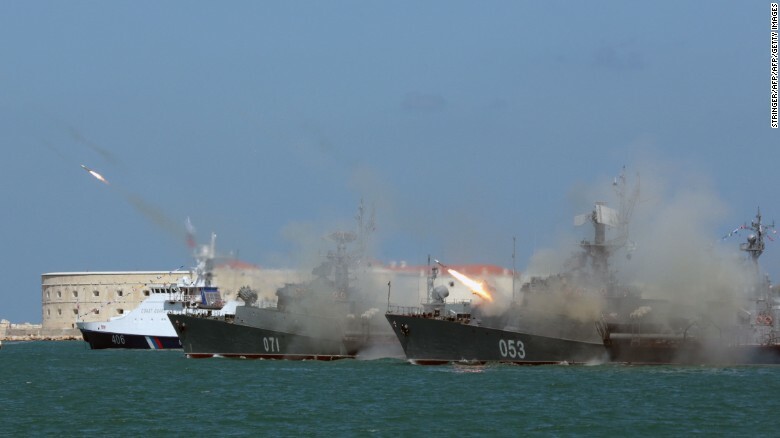 Russian navy frigates fire missiles during Russia’s Navy Day celebration in Sevastopol in Crimea. Established in 1939, Russian Naval Day was originally celebrated on July 24 and was changed to the last Sunday in July in 1980.